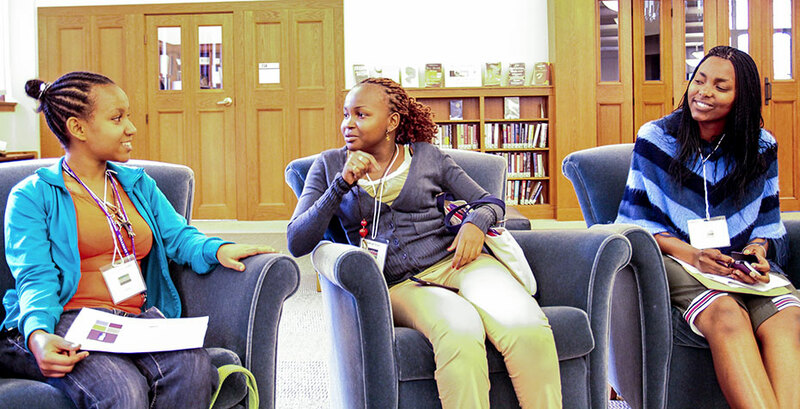 As the Class of 2018 settles in to life on campus during Orientation, Wellesley welcomes its second cohort of MasterCard Foundation scholars, who are among the 114 international students in the class. Meba Gebre ’18, Lisa Luka ’18, and Sarah Nzau ’18 come to Wellesley through the MasterCard Foundation (MCF) program, which offers scholarships to promising African, Latin American, and Middle Eastern high school students to pursue studies in the United States and Costa Rica. These three follow Martha Khalayi Aywa '17 and Refilwe Kotane '17, Wellesley's first MasterCard Foundation scholars. Karen Pabon, international student and scholar advisor and director of Slater International Center at Wellesley, says, "We are excited to welcome the MCF scholars to the Wellesley community as they will add to the already diverse population that we have at the College and share their life experience and world views both inside of the classroom and outside of the classroom. They will have ample opportunities to do this through their participation in our many extracurricular and experiential learning opportunities." Wellesley College is one of 10 higher education institutions to partner with The MasterCard Foundation when it launched a $500 million education initiative to provide talented, economically-disadvantaged students from developing countries—particularly from Africa—with comprehensive support for quality and relevant secondary and university education. The program was announced in September 2012 at a United Nations Special Session marking the kickoff of U.N. Secretary General Ban Ki-moon’s education initiative. “Wellesley was chosen to partner with the MCF because of its shared values, academic excellence, nurturing environment, and programs relevant to developing countries,” Pabon explains. “Through this partnership, the college has become part of a global network of educational institutions and nonprofit organizations that are committed to educating young people who will give back to their communities." Mebatsion (“Meba”) Gebre ’18 comes from Addis Ababa, Ethiopia. Gebre won a highly competitive scholarship to the International Community School of Addis Ababa, where she spent her high school years. She was involved with a number of activities, including theater and Model Union. Gebre plans to pursue chemistry, astronomy, and engineering while at Wellesley with the goal of returning to Ethiopia to work in the energy sector. Gebre believes Wellesley will help her “aim higher” in her life goals and inspire her to do great things. Lisa Luka ’18 lives in Harare, Zimbabwe. A standout high school student, Luka won the Resolve and Determination Award from the Hellenic International Academy which she attended. Her gift for mathematics made her a valuable member of the school quiz team and science Olympiad team. Luka wants to become a neurosurgeon, as she is fascinated by biology and the way that biology and chemistry labs are designed. She hopes to work with United Nations charities and employ her research abilities to work for cures for AIDS, cancers, and other life-threatening diseases around the world. Sarah Nzau ’18 is from Mombasa, Kenya. Nzau graduated from Memon High School in 2013, and placed 25th in the nation on the countrywide KCSE exams. After graduating, she completed a year-long internship with the Equity Bank of Kenya, one of the largest banks on the continent. She plans to study biochemistry at Wellesley with an interest in chemical engineering. Ultimately, she wants to return to Kenya to work in the pharmaceutical industry while promoting the importance of female leadership.